Sorry I have been absent from the blogging world for awhile (if anyone noticed). But I have been doing some housekeeping, or at least organizing, and some learning. First, the organizing. I finally sat down over the holidays and printed out the contents of all my hard drives, of which I have quite a few. Now supposedly, I will be able to find the original of any photograph I have processed over the last ten or more years. Given that I started putting my photographs on computer back around 2000, via film scanning, I have a lot of photos. In fact, the printed list of folders covers over 30 pages, small type. The idea for this undertaking was that I wanted to go back in time and see how my photos have changed. A combination of growth in skill (I hope), changes in technology and changes in processing even just within Photoshop and Lightroom. One of the delightful things I discovered is that a lot of my old files can be updated automatically to work in today’s Photoshop. That does give them a fighting chance against my newer files. The second thing I learned is that some of my old photos ain’t that bad. And also that I had some really interesting encounters with wildlife back then! So although it was a boring job printing out the drives, I had motivation having peaked at my old photos. So over the next while, I will share some of my older work with you. All of it, of course, from the Lardeau Valley. The learning came about from a couple of photography magazines I get. In particular, Digital Camera World from England and MagBooks. (Of course Photoshop also has reams of tutorials). The first magazine always includes small DVD’s with tutorials on them. Many of these are reviewing some aspects of Photoshop. Now I have been using Photoshop for years as my processing software. Generally tweeking exposure, hue/saturation, a little sharpening. But I have never delved into any of the next level of techniques and tools. Layers and masks, for instance, have always fascinated me but I have never tried working with them. With so little to photograph outside right now, I finally decided to try and grasp these tools. I’m still working on them but having fun playing with them. One of the reasons I would like to grasp their full potential is that sometimes, particularly when shooting down at water, the water background comes out in less than desirable colours and even texture. I have had numerous shots I couldn’t/wouldn’t use because the background sucked. Especially with my osprey, where the nest is slightly below me and the best time to shoot is later in the day when the sun is over my shoulder. Unfortunately, that puts the sun on an angle and soon to go behind a mountain casting everything into shade. So the colour ins’t great although the birds may look fine. Or else I photograph a bear with something in the background that is intrusive or distracting. In all of these cases I have tried hue/saturation or healing brush/cloning etc to save the photos. Now I am hoping that with layers and layer masks I can rectify some of these issues. 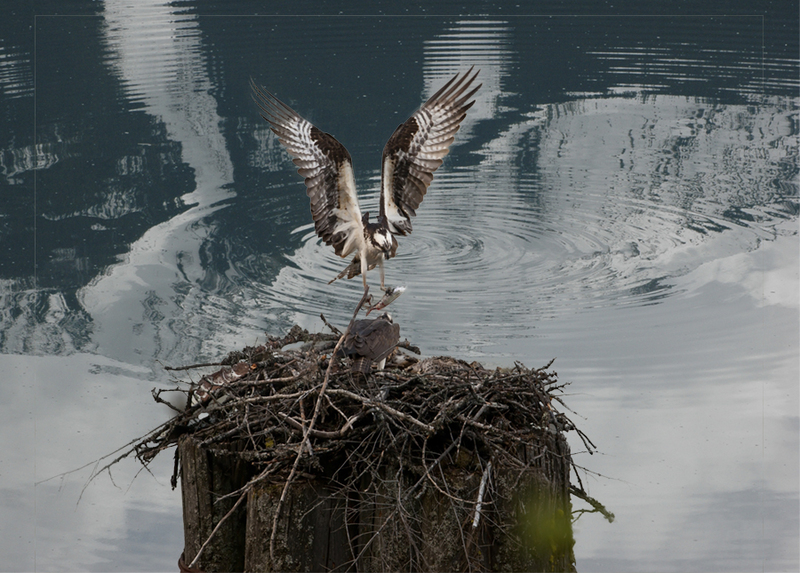 I am including a photo that shows what I mean about the osprey. Any ideas of how to fix this will be gratefully accepted. Feel free to step in with your ideas/experience. The ripple in the background is from a duck in the original background photograph. I rather doubt I would ever use these techniques for a photo for sale or show. But it is a lot of fun trying out these tools. 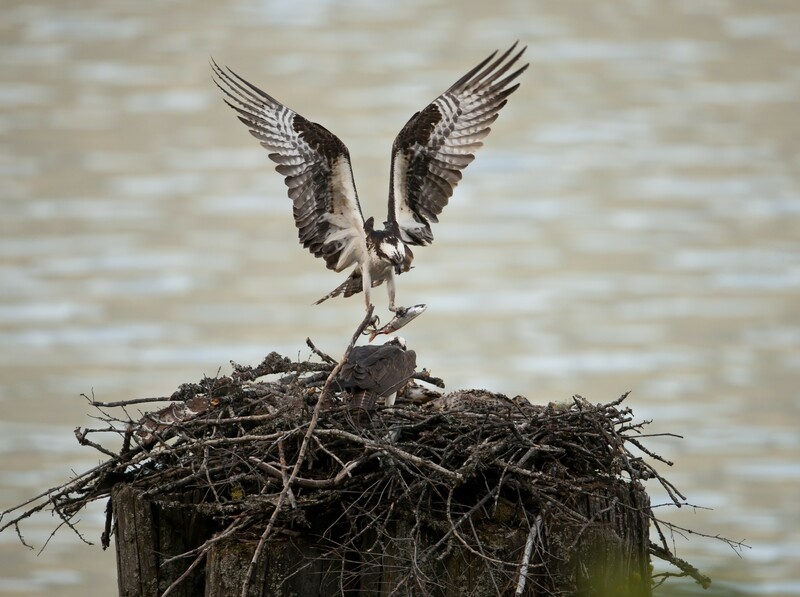 So feel free to give my your advice on the techniques and the photo challenge in my osprey shot. I could not have taken the shot from anywhere else so the taking of the photograph is a given. In fact, every year I am faced with that reality on some days with the osprey. So it is post photographing advice that I would love. Until next time, when I show you what has been happening in the creeks and rivers so far this winter, back to the books, actually the DVD.